In July 1915 Edgar Rubin, a 28-year-old Dane, defended a doctoral thesis titled Synsoplevede Figurer (Visually experienced figures) at the University of Copenhagen (Rubin, 1915). His official opponents were the two outstanding representatives of psychology at the university: the philosopher Harald Høffding, and the experimental psychologist Alfred Lehmann. Neither of them, it is fair to claim, could have foreseen the influence this thesis and its findings would eventually come to play in perceptual psychology. It was in this work that Rubin first elucidated the figure–ground distinction, now a staple of every introductory textbook of psychology. It was also here that he presented his celebrated illustration (see right). Who was Edgar Rubin, and how did he hit upon the topic for his thesis? Edgar Rubin was born of Jewish parents in Copenhagen in 1886. Rubin enrolled at the University of Copenhagen in 1904 and finished his magister artium examination in philosophy with psychology as his major in 1910. This psychology degree – part of philosophy as was then common – was probably second to none then being offered at universities (Pind, 2009a). It involved an in-depth education in philosophy as well as in experimental psychology. The philosophical part of the curriculum was mostly in the hands of Harald Høffding (1843–1931), a highly prolific and acclaimed author, widely known for his two standard works, Outlines of Psychology (Høffding, 1891), and A History of Modern Philosophy (Høffding, 1900). Experimental psychology at the University of Copenhagen was taught by Alfred Lehmann (1858–1921), a natural scientist who had been drawn to experimental psychology (Pind, 2009b). Lehmann was a highly productive scientist, a pioneer of psychophysiology (Lehmann, 1912). After finishing his master’s degree, Rubin in 1911 went to Göttingen in Germany where he worked for two years in the laboratory of Georg Elias Müller (1850–1934). When Rubin arrived in Göttingen, Müller handed him a topic for investigation, namely to look at the recognition of visual figures viewed at different angles and sizes. At this time, Müller’s laboratory had been engaged in research on memory for many years. Rubin does not elaborate but we can safely assume that it is the distinction of figure and ground which he is here alluding to. In Rubin’s memory experiment he projected figures cut out of cardboard against a uniform background. Here he noticed that his perception of the stimuli sometimes reversed so that what was ostensibly the figure could in fact be perceived as ground with the former background now being perceived as figure. Rubin gave his participants specific instructions as to which part of the stimulus should be perceived as figure, which as ground. Later, in recognition tests, he would again instruct his participants as to which part should be perceived as figure, and which as ground, finding that this had a marked effect on the recognition scores. If the instructions on encoding and recognition agreed, the participants correctly recognised almost half of the stimuli but only a tenth of them if the instructions did not agree. The finding of figure–ground reversals led Rubin to abandon his work on memory and delve more carefully into the nature of the figure–ground distinction itself. In this investigation, Rubin’s major aim was to describe the visual experience of figure and ground. He analysed his own perceptions and those of numerous participants, written down in detailed verbal protocols. Here Rubin established that there are several aspects to the figure–ground distinction. The most important of these is the fact that the experienced figure and the experienced ground are not shaped in the same manner – indeed the ground, in some sense, is without shape. Sometimes the ground, when it changes into a figure, takes us by surprise, due to that fact that it now becomes a specific shape. There is a contour separating the two areas of figure and ground from which a ‘shaping effect’ emanates. This only or primarily affects the part seen as figure. Indeed, sometimes the contour only seems to affect the figural part when the ground is experienced as extending behind the figure. A second aspect of the difference between figure and ground is the ‘thing-character’ of the figure as opposed to the ‘substance-character’ of the ground. The third aspect of the figure–ground difference concerns colour. As an example, colour constancy is more pronounced in the figural area than in the ground area. A fourth difference concerns subjective localisation, with the figure usually being perceived as closer to the observer than the ground. A fifth aspect is that the figure tends to ‘dominate consciousness’ and is more memorable than the ground. Finally, there is an emotional difference, with the figure often leading to an affective response which does not hold for the ground. In his dissertation, Rubin also discussed the issue of whether there are any rules for which of two adjacent areas will be seen as figure, which as ground. Here he noted a ‘fundamental principle’ – an enclosed area, which is smaller than an enclosing area, is more likely than the surrounding area to be perceived as figure. If the stimulus consists of two areas with more or less equal status, there is a tendency for the lower part to be perceived as figure, presumably a reflection of the situation of our visual world where objects are perceived as lying beneath the horizon. Rubin discussed numerous other issues in his dissertation, including the possibility of experiencing lines having no width – a finding, incidentally, which he was delighted to find also described by his favourite philosopher, David Hume. Rubin additionally reported the results of numerous drawing experiments and a comparison of ‘areal figures’ (such as the classic ‘vase’) and line or stroke figures, as drawn with a pencil. The difference between figure and ground is, in Rubin’s view, fundamental. Attention, in the works of Wundt and Lehmann, involved ‘degrees of clarity’. The fact that an area when changing from ground to figure takes us by surprise is conclusive evidence to Rubin that the difference is not to be explained as a question of attention but involves a specific perceptual process. The opponents at Rubin’s defence, Høffding and Lehmann, were impressed with the thesis, though Lehmann was also puzzled by what he termed its ‘mysticism’. ‘The boat of my soul staggers,’ Lehmann added, quoting Rudyard Kipling’s Kim (as reported in the Danish newspaper, Berlingske Tidende, evening edition, 8 July 1915). Rubin’s thesis indeed broke new ground compared with Lehmann’s own solidly psychophysical approach to psychology, and it was perhaps little wonder that Rubin’s methodology – the detailed phenomenological description of visual experience – had mystified Lehmann. It did not, however, mystify a group of Rubin’s contemporaries, Max Wertheimer, Wolfgang Köhler and Kurt Koffka, pioneers of the Gestalt movement. They eagerly embraced Rubin’s study, which came to feature prominently in Koffka’s (1935) standard work, Principles of Gestalt Psychology. Rubin, though, was never happy with being counted as one of the Gestalt psychologists. While admiring their descriptive psychology, he was sceptical of their attempts to construct wide-ranging theories. Rubin succeeded Lehmann as Professor of Psychology at the University of Copenhagen in 1922, a position Rubin held until his death in 1951. Rubin’s own aim throughout his career was the ‘modest’ (his own word) and careful description of psychological phenomena. He termed his approach aspective psychology, a descriptive psychology concerned with different aspects of mental life (Rubin, 1949). One of these was the visual experience of figure and ground. Høffding, H. (1891). Outlines of psychology. London: Macmillan. Høffding, H. (1900). A history of modern philosophy. London: Macmillan. Koffka, K. (1935). Principles of Gestalt psychology. London: Routledge & Kegan Paul. Lehmann, A. (1912). Grundzüge der Psychophysiologie. Leipzig: O.R. Reisland. Pind, J.L. (2009a). 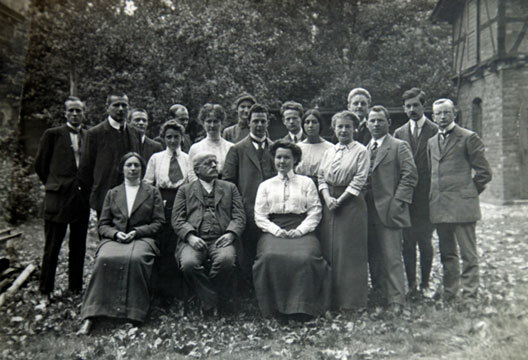 An education in psychology: The development of psychology as a field of study at the University of Copenhagen 1850–1950. Nordic Psychology, 61, 46–61. Pind, J.L. (2009b). A tale of two psychologies: The Høffding–Lehmann controversy and the establishment of experimental psychology at the University of Copenhagen. Journal of the History of the Behavioral Sciences, 45, 34–55. Rubin, E. (1915). Synsoplevede Figurer: Studier i psykologisk Analyse. Første Del [Visually experienced figures: Studies in psychological analysis. Part one]. Copenhagen and Christiania: Gyldendalske Boghandel, Nordisk Forlag. Rubin, E. (1949). Experimenta psychologica: Collected scientific papers in German, English & French. Copenhagen: Ejnar Munksgaard.